The Air Display app combo for iPad and macOS is one of several options to expand your Mac's desktop to the iPad —AppleInsider examines a wireless way to connect the two and expand your macOS screen. Air Display hasn't been updated in 11 months, yet it was once topped many a rundown of best iOS apps and remains a strong option if you need a second screen. Specifically, it's for when you want to use your iPad as a second monitor on your Mac. 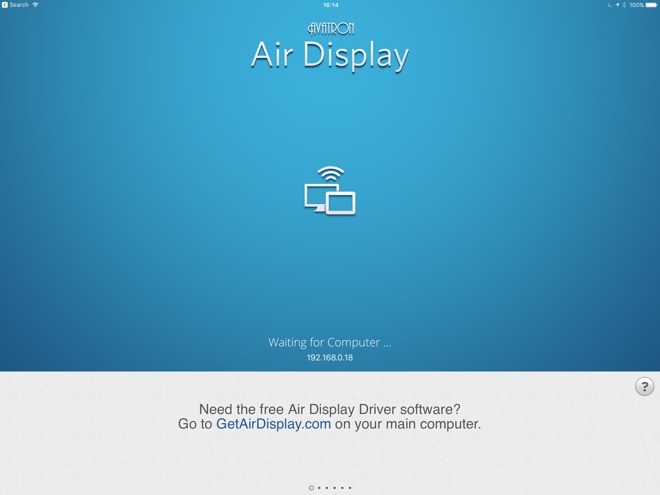 You buy this app and then you download the free Mac companion one, Air Display . The two talk to each other and work in sync. You can directly plug an iPad running Air Display into your Mac, like with Duet Display, but Air Display's key feature is that you don't have to. Just using a wifi connection is enough. So perhaps you only use your iPad when you're traveling. 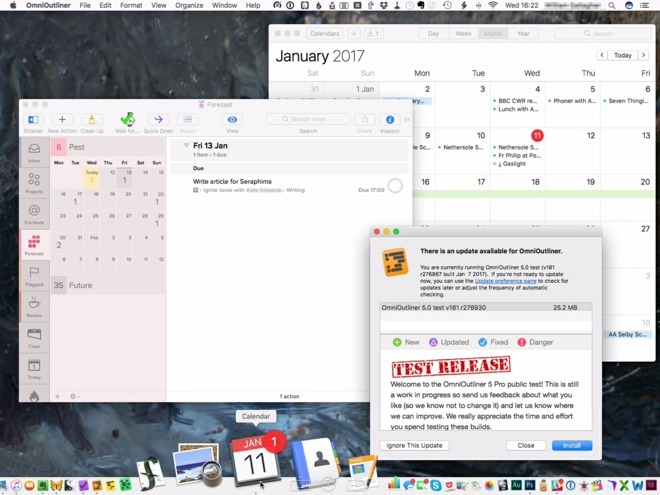 Save it being a wasted device during the working day by making it a second screen on your Mac. Drag your email over to it, move your Photoshop tool pallets there. Or if you need to show someone how to do something on your Mac, hand them the iPad while you work. You can have Air Display mirror exactly what's on your Mac's screen. So, AirDisplay is, in fact, a useful and clever app. It predates Duet Display which has been reviewed previously and is limited to a wired connection. In our use of both apps, it feels as if Duet Display's makers have a greater knowledge of the Mac hardware. Air Display's big advantage is this wireless ability, and it mostly works well. Once you've set it up the first time and it's running away, your iPad does indeed act as a second screen to your Mac. It's an extension of your desktop or it's a mirror of it: the choice is yours. Move your Mac cursor to the side of your main screen and it appears on the iPad. You can use that Mac cursor and your mouse or trackpad exactly as you would on your main screen. Alternatively, though, you can tap and swipe on the iPad display as ever. Apps on that screen respond to your touch. In action, it's a little jerky. As you drag a window from your Mac screen to the iPad, it works but it jerks. Sometimes the window doesn't appear on the iPad until you stop dragging. We also had the odd display hiccup as we presumably dragged too quickly. There would be the app where we placed it but maybe the toolbar still duplicated somewhere half a drag away. This is all quite understandable given how much data is being passed back and forth between the Mac and iPad. Equally, you're right to presume that a faster Mac and quicker or uncongested wifi would help. However, to get all this to work at all, Air Display has to do some tinkering behind the scenes and not all of that is communicated well to the user. For instance, Air Display changes an Accessibility setting for no reason that we can see. Specifically, it switches off the transparency on your Dock so that behind all of your apps is a strong white bar. You can see the difference immediately. In person, working at a Mac with that in front of you, the white bar is much more vividly distracting than it seems in an image. It presumably does this because of some issue with how the iPad displays graphics. When you cursor down to the foot of your Air Display-running iPad, it shows you the Mac Dock. It's handy to have it there except that you're rarely going to use it: you will always do anything intensive like starting up a new app over on your main screen. If it has to have the Dock, and it has to change the background, fine. It would be better to know it was going to do that —and it would be better still if it were clear that this is what has happened. You either know about this transparency setting or you don't. So the very best thing might have been if Air Display support replied to us when we asked about it. We used their support contact form twice over about three weeks but have yet to have an answer or even an automated acknowledgement of receipt. So Air Display works, and in fact it works very well, but it has rough edges. Some are inevitable when the connection is wireless, but having the freedom to take this second screen further away than the length of a Lightning cable is very good. 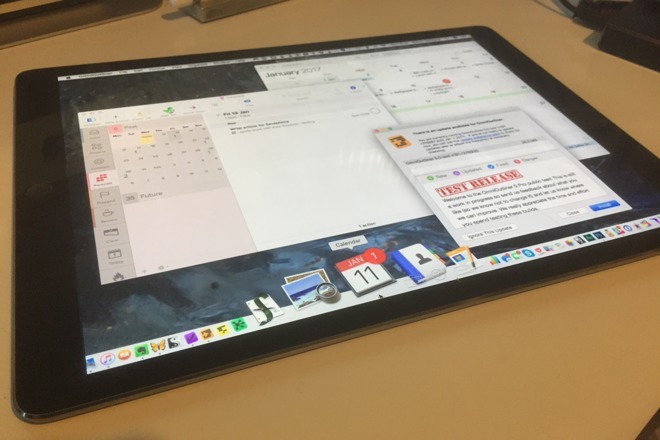 However, even when using AirDisplay connected through a Lightning cable, the display oddities were reduced yet persisted. We're not sure why, and like we said, Avatron support isn't talking. Air Display 3.0.3 requires iOS 7.0 or higher and costs $9.99 on the App Store. You also have to have the free version running on your Mac. Confusingly, the Mac App Store contains a macOS Sierra version of Air Display but it's not the one you need. The free app you need is available directly from the makers' website.